hot.... yes.... constant re-water all teh kennels -- and check that every dog has gates open with access to airconditioning. the new fan/mister the one the football teams use seems much more reliable ? big fogg?--- without the filter problems- but it is less drenching - even turned on high...... which i rather enjoyed about the other... ?auramist? someone sent me a web of a dane kennel in colorado... which is 86 miles from my sister in pagosa springs---unfortunately she is not a dog person--so i don't know why i even comment on the locatoin ---- buit the dogs look "square". it never ceases to amaze me how many advertizements can be forced across my field of vision by this foolish aol internet.. from dental implants to toenail fungus... i hate to tell someone my subliminal is overflowing. THAT LOGIC IS PERVASIVE IN THE INTERNET. BECAUSE THERE IS NO EDITOR..... EXCEPT FOR THE POOR GUY WHO TRYS TO KEEP ANY DISCUSSION ON TOPIC, PLEASENT AND EDUCATIONAL.. WHICH IS WHAT EXPLORE TRYS TO DO-- THEY MADE SOME RULES... http://explore.org/extra/community_guidelines/ GO READ THEM. BUT I CAN NOT SIT AND TYPE LONG INVOLVED ARGUEMENTS IN THE COMMENTS.... I JUST DON'T HAVE TIME..... EVEN THO I WOULD LOVE TO. I WOULD EVEN SET UP A SPECIAL TABLE AT DOG FEST FOR ARGUING--- ANYTHING..( EXCEPT POLITICS AND RELIGION.. ) THAT IS THE CORRECT WAY TO VOICE YOUR OBJECTIONS... NOT SLIDING AROUND BOOKING FACES AND EMAILING INNOCENT STRANGERS... COME HERE AND BATTLE IT OUT. I REMEMBER....... WHEN SOMEONE OF MY HIGHSCHOOL TEACHERS WAS TRYING TO GET AACROSS TO US THE CONCEPT OF INFINITY .. SAID "IF YOU GIVE ENOUGH MONKEYS ENOUGH TYPEWRITERS, ONE WILL TYPE THE COMPLETE WORKS OF SHAKESPEARE"
SOMEHOW I THINK THE INTERNET COMES CLOSE TO THAT CONCEPT. I JUST WANTED TO GIVE YOU AN UPDATE ON MS. IVY. WELL, THE LAST COUPLE OF WEEKS HAVE BEEN SHEER HELL FOR ME AS FAR AS MY LEG TREMOR IS CONCERNED. MS. IVY, TAKING ME UP STAIRS WILL ACTUALLY STOP ME WHEN THE TREMORS ARE SO BAD AND SHE WAITS PATIENTLY UNTIL I CAN WALK SAFELY AGAIN. THE SAME GOES FOR WHEN I GO DOWN THE STAIRS. I KNOW SHE WAS TRAINED FOR GETTING ME UP AND DOWN STAIRS, BUT FOR STOPPING ME WHEN SHE KNEW I COULDN'T GO UP AND DOWN BECAUSE OF THE TREMORS IS A PLUS. THANK YOU SO MUCH FOR ALLOWING ME TO GET MY LIFE BACK. LOVE TO ALL AT SDP. IT IS VERY QUIET......DAWN LEFT---AJAY GONE--- WITH NO ONE BOOKED--- FOR AUGUST.... EXCEPT MARY AND MIA-- WHO CAMPS OUT...AND THEN THE BUNCH COMING FOR DOG FEST.. I BETTER GET THESE MONKEY FISTS DONE.. I HAVE FOUND AND LOST THE GLUE GUN 14 TIMES IN THE PAST WEEK... BUT I BETTER GET AT IT. EACH MONKEY FIST NEEDS JUST ONE DROP OF GLUE TO KEEP THE END FROM UNRAVELING. PERFECT HOT DAY JOB... I AM TRYING TO GET ONE DONE FOR EVERY DOGFEST ATTENDEE AND SPIRIT STICK. WE HAVE HAD SOME NO NONSENSE SERIOUS DATES... BENTLEY X SCARLOTT ARE PRO'S AT 21 MINUTES YESTERDAY-- AND HER DAUGHTER MISCHIEF AND JASPER... FINALLY 26 MINUTES..
LEAVING US.. AT THIS MOMENT... WONDERING ABOUT OPAL AND WONDERING WHAT TO DO ABOUT GUSSIE... THAT GUSSIE IS A TERRIFFIC LOOKING DOG... WE COUD USE 10 MORE LIKE HER IN TRAINING.. OPAL'S PERSONALITY IS PRETTY DARN GOOD... SHE HAS A JOB BOOKED FRIDAY-- AN ART CLASS-- I THINK JACKIE IS ORGANIZING IT. It has been a busy summer so far for Dolly and I. We have been to a lot of picnics and outside gatherings. I know one of the things that I had mentioned when I applied for a service dog was that I had hoped to be able to regain my ability to walk through the grass independently again. Well that has been a dream come true!! I can't even begin to really put into words the joy, the pleasure, the excited/contentment that I feel by being able to do these things that years ago I never gave any thought to. I at no time would I get to the edge of the sidewalk, stop and wonder, " How am I going to get over "THERE"?" But that had become a reality of mine. I would stop and wait for my "service husband" to come along and help me. If he wasn't with me I would have to rely on a family member r close friend. A few weeks ago was my granddaughters 3rd. birthday party and Dale had to work. I treasure being able to capture family memories and milestones with photos. I was so grateful to be able to do that with Dolly's help. I was able to walk around the yard and capture pictures of kids playing in the pool, the sandbox, doing the pinata, and of course the cake and gifts. The sense of independence is unquestionable. Dale was able to make it to the party later that evening. He shared with me how Dolly and I were coming down the stairs from inside the house. There are approximately 4-5 steps leading outside. There is no railing. Dolly and I came out the door and down the steps as Dale was sitting talking with my Dad. Dale remained seated, as he no longer needs to jump up and rush over to help me navigate stairs anymore (YAY for both of us). Apparently my dad watched as Dolly and I came down the stairs and in awe replied "That is amazing". While he has seen Dolly and I work on a regular basis, he too is sometimes still taken back by it!! THE PUPPY GAME SO FAR? MORIAH TIED WITH GROMET NOT PREG WAS IT ?? GROMET?? OR MORIAH??? 'S FAULT..
BENTLEY TIED SCARLOTT YESTERDAY 26 MINUTES SHOULD WORK-- BOTH BEEN ON DOXY IN CASE WE ARE HAVEING THIS NEW "ANTI PREGO VIRUS"
GUSSIE WOULD NEED TO BE BRED BEFORE WE CAN DO AN ULTRASOUND TO SEE IF OPAL IS PREGO. SO DAWN AND I WENT TO ANN'S --- AS THERE IS SOME HISTORICAL SIGNIFIANCE TO ANN'S PLACE...---ANN, AT (MY AGE) COULDNT REMEMBER MY STORY BUT I AM SUER SHE ONCE KNEW IT AND WOULD BE THE FIRST TO TELL ME I WAS NUTS.. WE LEFT HER ON HER COMPUTER LOOKING UP CARROTS AND HORSES..
AND.... MY PRESENCE WAS NOTED BY SOMEONE ELSE IN THAT AREA FOR BEING ABLE TO SPLICE ROPES--THIS ROPE SPLICING HAS GIVEN SDP 2 SIGNIFICANT DONATIONS.. LESSON BEING... IT DOES NOT HURT TO LEARN ANYTHING.... --- YOU CAN NOT TELL WHEN SUCH LEARNING MIGHT COME INTO PLAY. 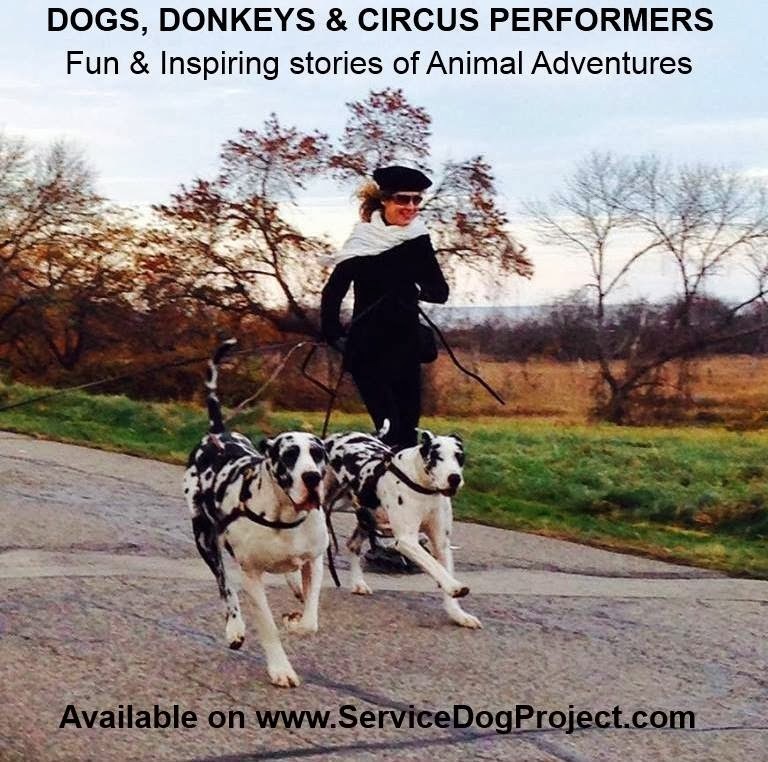 From the town crazy lady (and her wacky idea that a Great Dane can help with mobility) to the skilled trainers, dedicated volunteers and supportive neighbors (living nearby or just a camera’s blink away), each plays a role in bringing up a pup. When I met Thomas, he lived with a community at the Service Dog Project (SDP) that gave him his name (a volunteer, Jackie, I’m told) his socializing (Hillary’s mom had him for many a sleepover), and his training (Colleen, Hillary and Megan). That community welcomed me with open arms and a lead with a monkey fist attached. It was my turn to learn to take care of the service dog that would take care of me. The idea of telling the story of this village hit me like the side of a barn. Or, more accurately, the front of a barn. When I saw the SDP laundry barn with its fresh coat of paint last fall, I envisioned it with a mural, with the varied colors of dogs represented: mantel, merle, harlequin. Though I’d never painted a mural, when I learned I’d be moving to the west coast before this fall, I envisioned what I might need to create this parting gift in appreciation for the gift of Sir T.
It Takes a Village To Raise a Mural. From the fellow artist who loaned her oversized studio (which could accommodate six 4-foot-by-4-foot panels) and huge amounts of time to my understanding husband and some dear, dear friends, each contributed to this project. Margaret helped prime boards and offered an artist’s eye when I needed it. Without her, I couldn’t have even started. With packing still to do, open houses to clean for, a house out west to consider, Andy watched me leave in the afternoon without comment. The day I mentioned I might be finishing up soon, he had the drill, screws, level and engineering plan for raising the mural. Motivated only in part by my being home to face the packing, his main intention was to help. Since I’m not the climb-a-ladder-with-a-giant-board-in-hand kind of girl, the panels wouldn’t have made it to SDP without him. The transport and mounting would not have happened without Jon and Andrea. They provided a pickup truck (everyone needs a friend with a pickup truck) and have always provided a heartwarming, compassionate pick-me-up whenever needed (everyone needs friends like that). Thank you volunteers, and in particular, village photographer Camera Mark who added his skill in documenting the mural-raising. Thank you, Mark. And all of the SDP neighbors – nearby and by camera – none of this story of service dogs could happen for future recipients without your support. And while I skipped out on packing and dinner and heavy lifting to tell the story of this village, there’s another story. During the process of painting the mural, Tommy hoisted me off the floor, got me unstuck mid-paint stroke, guided me throughout the room when I needed it. I truly couldn’t have completed this gift without the help of my guy, my gift. Such a good boy. It Takes a Village To Raise Awareness. Even with a gorgeous Dane by my side, saying disabled and I in the same sentence did not come easily. The village full of supporters helped. As did a gorgeous soul with a Dane by her side. With Lynne, I found the voice to speak up, to speak out about service dogs, to shout out about friendship, to call out for others to bring service dog awareness to their locales. I’ve started packing. My “Service Dogs Lead from the Heart” Tshirts are in the same box as a stack of brochures. I’ll be spreading the word westward. This Dame with Dane may be leaving town but I’m not leaving this community. PLAN OF THE DQAY.... IS TO GET HTE FLYING EGG CONTRAPTION OUT ONTO THE GRASSY AREA BY THE CAMERA.. AND RUN A FEW TESTS...-- BUT FIRST I HAVE TO GO BUY SOME STORE BOUGHT EGGS... AND MAYBE GET THEM PAINTEDD-- ONCE PURPLE AND A COAT OF POLYURETHANE?? ?-- AND MAKE SOME THE 3 MINUTE BOILED WHICH ONCE WERE THE WAY TO GO WITH A BREAKFAST EGG.. WE HAVE SOME EXPERIMENTING TO DO. QUESTION OF THE DAY.... THE KID WHO SAYS "I NEED A PAIR OF THOSE $100 SNEAKERS" IS THERE EVER ANY CONNECTION BETWEEN HOW MANY HOURS SOMEONE (PARENT) WOULD HAVE TO WORK TO BE ABLE TO PAY $100 FOR THE SNEAKERS. OR MORE IMPRESSIVE-- HOW MANY HOURS IT WOULD TAKE OF FLIPPING HAMBERGERS OR BAGGING GROCERIES AT THE MINIMUM WAGE. TIME IS THE ONLY TRUE CURRENCY. DAWN ( OF TEACHER AT STEDMANS FAME) IS HERE AND IN TRYING TO FIGUREOUT IF THERE IS ANYTHIGN WE CAN DO TO GIVE HER MORE AMUNITION TO EDUCATE... IT IS SUGGESTED WE ANSWER A FEW QUESTIONS FOR THAT SHORT TIME BEFOER MAIL CALL BECAUSE THAT IS WHEN THEY CAN WATCH ( BEING IN A DIFFERENT TIE ZONE..) IT IS NOT A BIG DEAL FOR US... WE GENERALLY ARE SITTING AROUND DOING NOT TOO MUCH BUT DIDDLING WITH THE CAMERA AND SOUND ANYWAY.. DAWN WANTED TO GET TO PEABODY WHERE WE HAD SAID WE COUDL PICK HER UP... HE SAID PEABODY WAS A BIG PLACE- AND WHERE DID SHE THINK WE COUDL COME GET HER... SHE.... KNOWING THAT SDP IS AN ARMY THAT MOVES ON IT'S BELLY...SAID--TAKE ME TO A RESTAURANT-- THEY ARE BOUND TO KNOW WHERE THAT IS... SO RED'S DINER IT WAS-- AND WE FOUND HER NO PROBLEM..
so what i have done-- once the regular board 2100 is sold out--- i will open teh bonus purple egg section -- which will not have as many bricks Probably more like a few hundred ?? ?-- the award AND THE THaNK YOU O GIFT FROM ME Personally for teh origional 2100 will not change... the bonus section will get the $50 gift from me along with a certificate of membership to the shatupon society of ipswich. now how will we do this??? take into considertion rules may change as needed.... but what is anticipated... the normal 2100 sell out numbers will be put on the board in the usual fashion 4 to a square..... a complete set of 2100 in the center of the board wheree the hens usuaqly end up... and a second set of 2100 around the perimiter just in case they wander... then the purple numbers will be put-- one to a square-- it is anticipated that the egg will drop and break randomly from the shute..splattering the egg..hopefully the yoke will be better defined.. so the number closest to the center of the yolk splatter will recieve teh membership-- and the $50 THANK YOU gift from me personally. we have gone to frozen eggs( but the yplk does not break--)we have painted eggs, boiled eggs ( had to research the 3 minute egg with the runny yolk-- the martha stewart lessons))-ithas been very scientific... however it does work... no two eggs land in teh smae spot. keeping in mind rules may have to be made to accomodate the oddities of this episode..
tehre is a mismatch here... what /when does a raw egg become a problem??? i used to love the real cesar salad... mixed at your table with the garlic- olive oil-parm cheese - raw egg- and not much else- FOR YEARS !!! that wAs before the noitce on the bottom of menu's about not eating raw eggs. MAYBE CHICKENS ARE NOW LAYING CONTAMINATED EGGS TO OBJECT TO THE FACT THAT THEY ARE NOT FREE ROAMING CHICKENS. so many ideas wheich were thought to be gospel truth get proven not only false, but silly. when i was i kid you were not to eat and then run around because you would get polio. now with the ability to pass eronious info around via teh internet there are soooooo many more people who can be taught to believe crackpot notions. used to be.. we were at the mercy of madison avenu3e as we were trained to buy certain products... a relatively harmless concept... but now this madison avenue training has invaded every facet of life- from medical to political. i am watching with interest how the media is handling-- or being trained to handle-- who knows-- the episode of traffic violation-- of not using your blinker. looking at it totally from the top down no blinker=you end up dead-- don't tell me i am to excuse the system because she had traces of marajuanna in her blood....i actually heard " isn't it terrible about the girl who committed suicide in her jail cell" and someone responded "i heard she had pot in her blood." training---- and these people vote !!! I wanted to confirm that tomorrow (Saturday, 7/25) is still OK to bring the finished (!) mural panels to SDP. My friend with the pickup (everyone needs a friend with a pickup!) will be delivering and he and Andy will have drills, screws, washers, caulk, flashing and other manly tools. Is 10:30 am still OK? I’m so happy to be bringing these panels to SDP! It’s been such fun painting them! I’ve been taking pictures along the way, and will take more of the “erection” (as my friend-with-the-pickup’s wife named it). Mark said that he would be happy to make a video for the CPers and other supporters. Fun! Hello! sorry it has been a while since my last update... Rogue is doing really well. We had a new baby on july 1, 2015... and Rogue has been super about our new addition but no one can come in the house or near me and the kids without Rogue telling them she is watching! I now will sit by her bed and pet her and reassure her that the person is okay. i dont have any adventure stories since we have been home with the new baby and not going out much. its been 3 weeks but i think soon i am ready to venture our with 4 kids and rogue. she sure knows i am having a rough time with my feet and walking around. she still loves to lick my cyst from the neuropathy on my feet! her training for balance has really helped me through the pregnancy and the problems with my feet and nerves. she is good for hearing but has been an awesome help when i need a hand because of the pain from my feet. rogue loves to work. she is great... and i will try to get her to get up off her bed to let me know the baby is crying.. right now she sits up and watches the baby cry. so i need to try to get her to come to me. but she sure does worry about me walking up and down the stairs and more since i am holding the baby... she really loves to help when ever she can and it makes her soooo happy ... thank you all so much and hope i can come visit soon. she is a beautiful friend and helper.. thank you so much.. i am very thankful she is in my life! .. NO VIDEO TODAY??? I HAVE A PROBLEM THIS MORNING WITH THE VIDEO-- I THINK IT IS BECAUSE THERE ARE TOO MANY PICTURES AND IT SHUT ME DOWN...AND MAY HAVE SHUT OTHERS TOO. I LIKE THE PICTURES-- BUT PLEASE SAVE THEM AND USE THEM ONE AT A TIME... OYHERWISE I CAN'T SEE ANYTHING. I DID FLAG 7 OUT OF 8 PICTURES... I DON'T KNOW EXACTLY WHAT THAT FLAG MEANS-- BUT HOPEFULLY IT FIXES THE PROBLEM. I WOULD LIKE TO FOOL WITH A BOOMERANG-- BUT IT WOULDN'T WORK TOO WELL IN THE OFFICE. FOLOOW UP STORY OF----JANINE AND THE FLAT TIRE 2 MILES OFF THE GEORGE WASHINGTON BRIDGE ( NEW YORK CITY FOR YOU FOREIGNERS)--WITH ONE DRAFT HORSE AND 2 YOUNG THOROBREDS, NO BREAKDOWN LANE, AND THE SPARE ALREADY USED-- ALONG WITH ONLY INCHES FROM THE 80 MPH TRAFFIC... I HAVE TO GIVE THANKS TO THE NJ STATE POLICE-- JANINE CALLED 911 AND AAA AND THEY HAD A WRECKER THERE IN MINUTES, 2 CRUISERS SHUT OFF TWO LANE OF TRAFFIC WHIOLE THE WRECKER CHANGED THE TIRE IN-- SHE SAID IT WAS LESS THAN A MINUTE WITH POWER TOOLS.. I GUESS SHE GOT OUT BEHIND THE TRAILER AND WAVED HER RED SHIRT IN THE AIR TIL THE POLICE ARRIVED WITH TEH FLASHING LIGHTS. I DON'T KNOW WHAT HAPPENED TO THE DRAFT AND ONE TB... BUT THE OTHER TB IS IN OUR BARN..
HOW DOES THAT COMPARE TO ANY HORSES YOU MIGHT KNOW? JANINE'S BLACK HORSE IS ONLY 2 INCHES TALLER 17 HANDS ( AND HEAVIER..) MARY-- OUR DONKEY WAS ABOUT 14 HANDS WHICH IS TALL FOR A DONKEY AND IS A SHORT HORSE. MY CHALLANGE OF YESTERDAY TUFTS VET SCHOOL IS DOING A STUDY ON BLOAT-- AND THEY ARE INTERESTED IN OUR "FAMILY" -- I DON'T WANT TO SAY BUT --- WE ARE VERY LUCKY TO HAVE HAD 4 BLOATS IN ABOUT 300 DOGS. Of the older dogs that have not bloated how many do not have a 1st degree relative that has not bloated? I TACKLED IT WITH ---BAILEY IS 12 ... AND NEITHER OF HER PARENTS BLOATED. I KNEW IT !!! last night news some guy has hacked into a car computers and can operate all your power stuff from fairbakns alaska--this is progress?? for years i have said ... if the car computer can tell you when something is broken, it is only a matter of time before they can break it so you need to go have it fixed by the computer holding company...think..." we should ship out 30" fan belts this week because next monday all green 2012 fords will break their fan belts." absurd....? if it is possible, it is doable-- and some clown can decide if it is thursday we can put on all jeeps left hand blinkers.--- these people are extremely bright-- and the pair who did ht hacking were actually hired by the automotive company to do just that. i hate it when my car makes decisions for me--- that thing that used to be the radio - being the worst.. and i am no friend of windshield wipers being connected to my headlights by an i/o switch that has noting to do with the actual on off lights, but an in sync or out of sync with the wipers. being unsure of anything i have to put the wipers on at night to be sure my headlights are on and if i want to to take a quick swipe of mist off the windscreen i slow down oncoming traffic by signaling presence of a police vehicle. society is just getting too convoluted for me..
hi are you a new kid- i heard you flew in a big plane - were you scared all by yourselrf-do you like it here- i can show you around...did you meet my big brother oliver?--- and there is a voodoo's bubble that says "when does she breathe?" meanwhile for all breeding dogs.... i bought a few bottles of doxy from george because the order from australia has not come yet--- and i wqs not ready for jasper and bentley to need to be put on it also. george's doxy is 100 mg per pill-- the australia doxy is 50 mg per pill- the cost has gopne down somewhqt since that huge spike which caused me to seek another supplier-- hence the petsmegastore.au purchase. i am hoping to get the bonus egg project done for this next shatting-- we may just have a practice run... and make it live for august. mariah 99% sure not pregnant.. no idea why ?? grommet?? mischief is in heat-- and here --- and jasper is here.. on deck-- jasper is good-- we know he is/was fine wiht 3 great litters.. but we don't know about mischief- and there is always the question i---- is something medical going on to stop moriah and opal from having pups already..
scarlott came in heat yesterday. she had pups 6 months ago-- i know what george will say.. i think... it will be if nature had intended her to have pups in 8 months, that is why she came in heat... but i will take her -- or at least seek his advice ovr the phone..
it could mean 3 litters at once.... we have been there before-- it is manageable--just lively and we have some great, organized volunteers..... plus another washer dryer coming in this cellar to make laundry easier...---but with all teh unknowns i think we shoudl take a chance and breed scarlott and bentley.......if george agrees..
so we must take that risk. if we get one more george we need to go that road... and deal with what we are given. this is why donna has several eggs drying on the kitchen counter, having dipped them in purple paint. it also explains why there are a few purple painted eggs in our freezer.... which - if you rememgber also contains bagged frozen dead rats wiating to have the "frozen rodent delivery company" take them to georges for his hawk rehab program. along with maybe giving bentley a bath... while at the airport bud and i noticed bentley "had an air about him"